A review of Non-Formal Learning in Museums and Galleries, by Alex Elwick. Museum learning is a big deal, and over the past decades, certain voices and approaches have come to dominate the field. In his thesis, Alex Elwick seeks to broaden the ways in which museology and museum practice think about learning in these settings, and to answer the question of how non-formal learning takes place here. He does this by bringing together concepts of skills acquisition and cultural capital into what he refers to as the “dual model.” The thesis title reflects the broad applicability of such a model, although the project itself focuses on adults and their engagement with art galleries in the North East of England. More specifically, Elwick uses his dual model to compare two different groups of people: museum “friends”—people who engage regularly and readily with art galleries; and people who visit museums and galleries rarely, if at all. However, while his social research is interesting, what sets this thesis apart is Elwick’s bringing together of diverse theoretical approaches, including non-formal learning, the psychology of memory, and Bourdieu’s concepts of cultural capital, field and habitus. A full three chapters of the thesis are devoted to critically reviewing and drawing together the literature from these diverse approaches, beginning with non-formal learning. Elwick argues (and, speaking as a former museum educator, I find myself agreeing), that studies of museum learning are more heavily weighted towards the formal learning opportunities in museums—the taught sessions, or those involving school groups. Following the lead of Michael Eraut, Elwick defines non-formal learning by its opposition to this type of formal learning. He also introduces the important idea that within discussions of non-formal learning, scholars must take account of and find ways to understand tacit learning, of which the learners themselves may not be aware. One of Elwick’s great skills is in straightforwardly summarizing, compiling and combining literature from a wide range of sources. He does this many times throughout the thesis, particularly in the form of tables that compare scholars’ different approaches. This means that even a relatively brief skim through the thesis (although I recommend you dwell longer) can quickly provide useful information including, for example, theories and definitions of learning, the science of memory, and visitors’ strategies for interacting with museums. Elwick rightly suggests that museum learning theorists often neglect a deeper engagement with the psychological theories of memory, and the implications of these for our understanding of less formal learning. Both Chapters 2 and 3, therefore, take a psychological approach to museum learning. This is used as a lens to review educational theories such as multiple intelligences (a theory which Elwick rejects), and also to provide new ways of understanding museum learning, for example the mental processes involved in meaning-making, behavior modeling, and encoding information. In doing so, he aims to “reach a more coherent conclusion with regards to how memory works in [the] context” of the museum (p. 49). The final chapter of the literature review (Chapter 4) focuses largely on Bourdieu’s sociological concept of cultural capital, and how this can be combined with Michael Eraut’s concept of skills acquisition. The “dual model” that Elwick subsequently presents (p. 95) predicts the behavior of museum visitors in these terms, which also fits well with familiar museum learning concepts such as the impact of visitors’ prior knowledge and experience. So, for example, “novice” visitors are predicted to find visiting stressful (cultural capital) and have a limited situational perception (skills), while “competent” visitors prefer to visit in groups for social validation (cultural capital) and tend to plan their visits carefully (skills), and “expert” visitors are comfortable with visiting alone (cultural capital) and are more versatile in their approach to museum visiting (skills). The social research element of this thesis goes on to use this dual model to frame accounts of museum visiting from frequent visitors (the museum “friends”) and irregular or non-visitors. Elwick is both perceptive and admirably honest about the challenges of carrying out museum learning research, particularly for this type of small-scale doctoral work, and also of the limitations of his own research project. His discussions of the importance of pilot studies, his description of grounded theory, and his tips on interviewing (leave the voice recorder running after you finish, to catch any final comments) are well worth reading, especially for anyone planning their own interview-based study. The second half of the thesis, Chapters 6 through 9, presents and discusses the research findings according to the themes of “modern” art and field theory, memory, learning, and the dual model. While I’m sure many of the findings will resonate with museum professionals’ own observations of their visitors, I personally found some of the findings surprising and challenging to my own perceptions of museum visiting and learning, showing how much I take for granted the impact of my own “expertise” in my judgements of effective museum programming. So, for example, my strong dislike of audio guides may not be because of an inherent problem with this technology, but because as an “expert” I value independence and flexibility in my museum visiting, while many people find the structuring provided by such guides to be helpful and reassuring, as well as interesting. I also very much enjoyed hearing the voices of Elwick’s participants reminiscing about their childhood visits to museums. There can be a temptation to be dismissive of nostalgia, but within the context of Elwick’s “memory” chapter it is presented as humorous, knowing and also as a vital component of the participants’ ongoing relationships with these museums. So, for example, one participant says, “I was a sort of boring, geeky child that just loved…boring wooden cabinets,” while another describes going to “Hancock, when it was in its dusty splendour and all these horrendous animals,” and also going to the Laing “because it was ‘the thing’ to be arty and…come in for a coffee which was a very bold thing to do.” As a former museum professional I know the incredible value of hearing this type of personal story, when the relationships of most visitors to the museums they visit are often much more of a mystery. This is an enjoyable and well-written thesis, which is notable for its readability. The literature review in particular provides an excellent resource for museum professionals wanting to ground their practice more deeply in theory and research. For me, the thesis also very much demonstrated the importance to museum professionals of understanding their own place within a model of skills and cultural capital, how this impacts upon their perceptions of what makes a good museum, and how different their museum visiting skills are from those of many of their visitors. Fieldwork undertaken with visitors and non-visitors of Tyne and Wear Archives and Museums. Newcastle University. 2013. 272 pp. Supervisors: Andrew Newman and Christopher Whitehead. 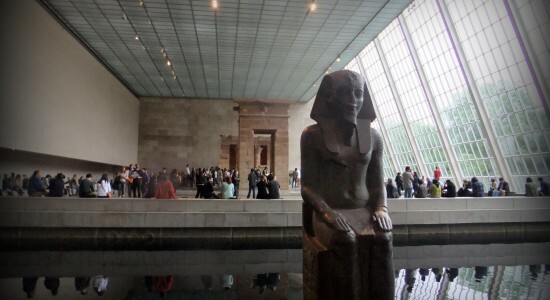 Image: Metropolitan Museum of Art, New York, 2013 (photograph by the author).